There’s information everywhere about how to improve your site’s rankings on Google, but what users don’t usually know is that there are a lot of no-no’s regarding SEO that can get your site penalized or completely de-indexed. Even if it happens by accident it can be devastating to your website and your business. What does it mean to be de-indexed? When Google sees minor things it doesn’t like on your site it may just penalize the site, meaning its rankings for certain keywords may decline. If the offenses are serious enough or frequent enough, though, Google may remove your site from its index altogether. Google’s index contains every website it’s looked at and has considered for potential ranking on search terms. 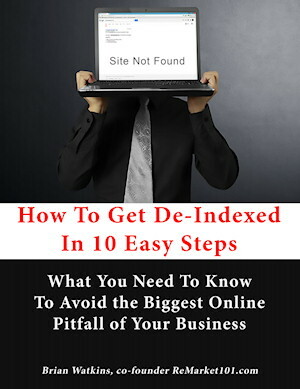 Your site can’t rank for anything unless it is indexed by search engines. Note that being indexed doesn’t guarantee that you’ll rank for your target keywords, but if your site is removed from the index you won’t show up in any searches. Worse yet, once your domain is de-indexed it can be very difficult to get Google to look at it again and see that you’ve cleaned up your act. So it’s always better by a long shot to avoid being in that boat. Duplicate content can involve different things, but in some form or another always means that content from elsewhere appears throughout your site. One black hat SEO technique Bob uses involves reusing the same content on multiple pages of his site to quickly create “a lot of content”. Other times Bob plagiarizes content from someone else’s site and uses it throughout his. This goes beyond using a snippet or quote from elsewhere and providing an attribution link – Bob copy/pastes whole articles or large segments of content and presents it as his own. When Google sees a little of this going on it may simply ignore or penalize the offending page. But when it notices this is prevalent throughout Bob’s site, it may decide Bob’s site isn’t worth being indexed at all. Sometimes Bob tries to get clever while pandering for rankings. He’ll target high traffic keywords that have nothing to do with the site he’s working on, and will present certain information in the title and description of the page to search engines that make it look like the page is about those high traffic keywords. In actuality, the page URL Bob shared forwards to an entirely different page – or maybe a different site altogether. This is obviously bad for the user experience, and is a huge no-no. Google may tolerate a certain amount of duplicate content, but this technique will get Bob’s site slapped down pretty quickly these days. Bob forgets that Google can read the code behind the visible part of the website we all see, and it can tell that the text is illegibly small or not even visible. It’s a warning sign the moment it sees this happening. Like with duplicate content, if this happens frequently throughout Bob’s site Google will decide it’s not worth ranking for anything. Google takes a stronger cue from keywords found in headers than regular body text. Headers are also great ways to visually break up the page content and organize it, but they’re best used sparingly. Bob has made the mistake of layering and overusing them. He wraps random images and text in <h3> and <h4> tags whether they make sense as headings or not, predictably using loaded keywords throughout so the page arguably has as much header content as body copy. First of all, Google likes to see headers progressing in order like a hierarchy, such as an <h2> followed by <h3> etc. When they appear wildly out of sequence or are used too often to be natural, it’s another red flag. Bob’s site may not be de-indexed for this offense alone, but it will definitely devalue his SEO clout on the offending pages or the domain as a whole. Affiliate links in and of themselves are fine (links in which you’re being paid for the readers you send through them). But like anything, they need to be used sparingly and carefully. It sounds like a good plan, except that these pages didn’t contain much or any original content and were set up in a way that was clearly more about ads than giving the reader anything. This is seen as very spammy, and next thing Bob knew none of his affiliate landing pages got any traffic. This one is similar to duplicate content. The idea is that Bob scrapes the internet for content written by others about things he wants to rank for, then fills his site up with their various articles. Maybe he even writes bots and algorithms to do this for him automatically (using sites’ RSS feeds). He thinks that by including an attribution link after copy/pasting their entire article it makes it okay. After all, he gave them credit right? And hey, now his site functions as sort of a news site that aggregates strong content from all over! But he didn’t get permission from anyone to use their content in its entirety. His whole site is full of their material, and Google notices that if they excluded the non-original content Bob’s site would have basically nothing on it. There’s no value in that for search rankings or for Bob’s potential readers, and if too much of Bob’s site is set up this way he’s on the fast track to de-indexing. Backlinks remain a good indicator to search engines of a site’s authority. After all, if a whole bunch of well-respected sites keep linking to you, presumably there’s a reason. Bob thought that by using online services that allowed him to purchase backlinks he’d have an ace in the whole. He wanted to rank for “SEO company” and paid people to create hundreds of backlinks all over the internet using “SEO company” as the anchor text pointing to his website. Since Google does look at the words within a link as a cue to the association to the linked site, surely this would build the association of Bob’s site and “SEO company”. Except that Google knows that there’s no way that many people/sites would, of their own volition, all link to him using exactly the same phrase. Now it’s obvious what Bob did, and his site ranking for that keyword is worse than ever. If you’re building backlinks make sure to vary the way the links appear. If a small number of links had indeed used “SEO company” as the anchor text, but also “SEO experts”, “web guys”, or maybe even “www.bobs-domain.com” it’d look natural. All people are going to link to Bob’s site differently, particularly if they chose to do it and weren’t paid. Years ago when backlinks were a stronger factor than they are now, and back before Google added a bunch of algorithms to stop it from being abused, Bob discovered he could build a whole bunch of low quality sites optimized for a certain keywords. Each of these sites linked to each other, with the idea being that the collective backlinks they all generated for each other would drive all of them up the rankings. And if they all linked mostly to one site in particular – his main site – then it would have powerful implications for his main site. “My main site will be seen as an authority because it has so many other sites referring to it,” he thought. Except that Bob was far from the only one with that idea, and it got out of control. These days Google is very good at tracking where backlinks come from and noticing patterns like this. It may work briefly, but very quickly every site in the collection will find its rankings plummet. Once some of them are heavily devalued or de-indexed, it damages the link profile of all others tied to them, collapsing the whole pyramid. Internal linking can be useful in moderation. If Bob is writing an article about web design and mentions themes people may want to consider, it makes sense for him to link to an article he wrote previously about those themes. That’s legitimately useful, and can even help Google understand what his site is about. But before long Bob started going crazy with internal links and wrote each paragraph as a setup for another link to somewhere in his site. He thought that if there were enough pages all linking to each other it’d build the power of all pages involved. Like the link pyramid debacle, this was both confusing to Google and overwhelming to the reader. It became obvious to Google while crawling Bob’s site that these pages were not created to help anyone, but rather to pander to his keywords. As a result his entire site lost ranking clout. If Bob’s site had a long history of abusive tactics like this with little redeeming qualities, his site might be de-indexed altogether because Google sees it as unlikely to ever produce anything useful. This is a general term that refers to any instance of making content more about keywords than being useful for users. It might mean overloading body copy and headers with blatant keywords, or using a ton of images for no other reason than loaded alt tags. It can also include loaded meta titles and descriptions where a keyword is used repeatedly and unnecessarily. There’s a lot to understand when looking at an SEO company. Most SEO companies have a standard set of services, but some SEO companies are better than others. So how do you pick a good SEO company? The best SEO companies avoid writing like this because it’s terrible. Mentioning “SEO company” every sentence is lame because it doesn’t read well and makes it clear there’s more concern for ranking for SEO company than being of any use to the user. Worse yet, if you’re worried that your competitor SEO companies are hunting for your keywords you’ve just made it really obvious, and now they’ll start writing terrible content about SEO companies, too. Don’t do this. It will weaken your SEO efforts overall and will create a poor user experience once they land on your site. At the end of the day the user is what it’s all about. After all, what good is a whole bunch of new site traffic if everyone leaves because they can’t stand your content? You haven’t gotten any new customers, so it hasn’t helped your bottom line and you’ve just wasted time and money.